Mönchengladbach - once again proved why he is considered to be the world's finest custodian following another incomparable display between the goalposts in FC Bayern München's 0-0 draw at Borussia Mönchengladbach. 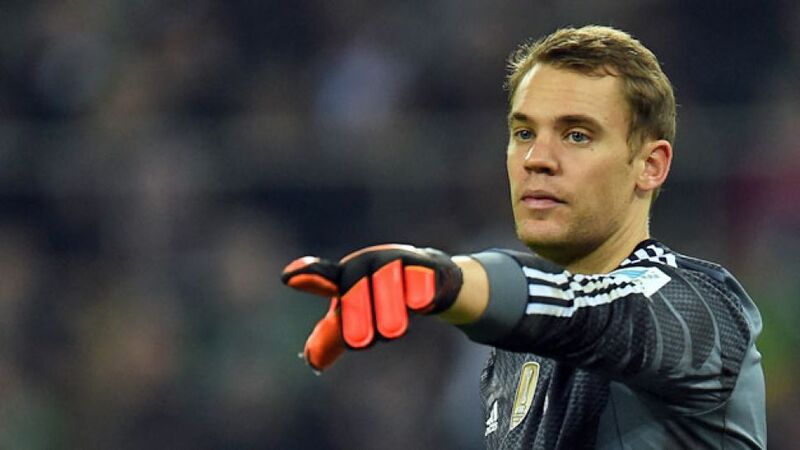 Question: Manuel Neuer, you were kept pretty busy in Mönchengladbach. Did you enjoy the game? Manuel Neuer: No. I enjoyed the last game against SV Werder Bremen a lot more because we scored six and won. Three points are always the most important thing in a game. Unfortunately, on this occasion, we're going home with just the one. Question: Still, you must have felt good putting in such a solid performance in Gladbach? Neuer: I've been playing well in recent weeks. The only mistake I made was in the international game against Poland. Apart from that, I've been having a good season. In other games, I certainly didn't have anywhere near as many saves to make - none against Bremen and one in Rome. I know I'm in good shape. Question: What did you make of the team's overall performance? Neuer: We were the better side in the first half. Over the course of the game, we didn't create many clear-cut chances. That's what was missing a bit. Then Gladbach had a few chances. At the end of the day we're fairly happy with the result. Question: Pep Guardiola said before the game the next ten days are the most important of the Hinrunde. Bayern are over the first hurdle after taking a point off a strong Gladbach side. What does that mean for the upcoming games against Hamburg in the DFB Cup and Dortmund in the league? Neuer: First up is the game against HSV. It's an important game, a knockout match. It was tough against them in the league and now we're going there again. Nothing will be given to us on a plate. They put us under pressure last time, so our build-up play in the final third has to be better. That way we'll create more chances to score. We didn't really do that last time in the [goalless draw]. That's our objective. Question: What do you make of the Bundesliga table? How happy can Bayern be? Neuer: It doesn't mean much. We've played nine games; a lot can still happen. We're happy with our position. We're top. We're only interested in ourselves, not who's behind us. The important thing is that we came away from Mönchengladbach with a point and didn't lose. It's important that we do our thing in the upcoming encounters. Hamburg's a difficult place to go and win. Question: What sort of game are you expecting against Dortmund. Do you feel a bit for them what with their current problems? Neuer: No. It doesn't matter to us. We're really only interested in ourselves, but we know it won't be easy against Dortmund. No game's the same. Dortmund being off form won't make it any easier. It's going to be a completely different game for them as well.